Efficient algorithms have been developed to model check liveness properties, such as the well-known Nested Depth-First Search, which uses a depth-first search (DFS) strategy. However, in some settings, DFS is not a suitable option. For instance, when considering distributed model checking on a cluster, or many-core model checking using a Graphics Processing Unit (GPU), Breadth-First Search (BFS) is a more natural choice, at least for basic reachability analysis. Liveness property checking, however, requires the detection of (accepting) cycles, and BFS is not very suitable to detect these on-the-fly. 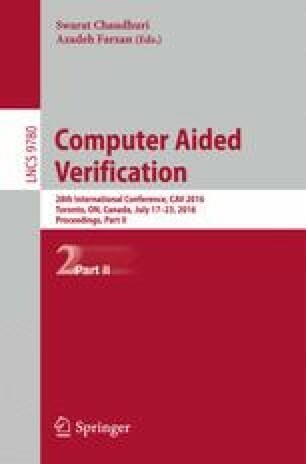 In this paper, we consider how a model checker that completely runs on a GPU can be extended to efficiently verify whether finite-state concurrent systems satisfy liveness properties. We exploit the fact that the state space is the product of the behaviour of several parallel automata. The result of this work is the very first GPU-based model checker that can check liveness properties. A. Wijs—We gratefully acknowledge the support of NVIDIA Corporation with the donation of the GeForce Titan X used for this research.